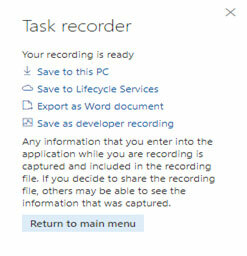 We have already seen how to create recording using Task recorder in dynamics 365 for finance and operation. We will use similar file for editing purpose as well as playing the recording as a guide to give better visual representation. - a. Path could be from the local machine or from the LCS or it can open the recent document. 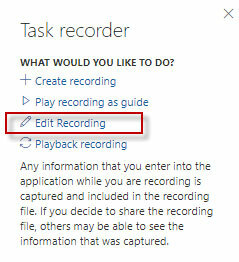 - h.	Once done we get different options to save the recording at different locations. Save to this PC: Choose this option to save the file on the local desktop with .AXTR extension. 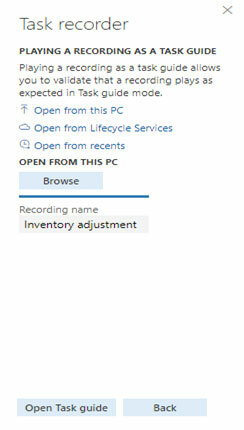 Save to Lifecycle services: to save the file in LCS asset library. Export as word document: choose this option to export the steps in the work document which we can share with user as a user guide or keep it for future reference purpose. 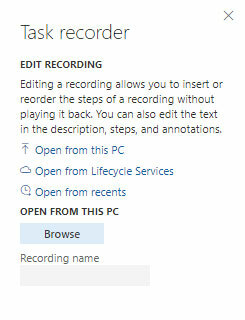 Save as a developer recordings: This option is used to save the file in the local drive in .XML format. 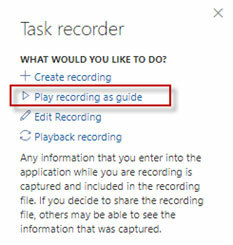 This will play the recording and as it goes through each steps, system actually redirects you to each form as if you are running the video recording. d.	Once file is chosen, it will be imported in the system. g.	As it goes though each steps, system will give you visual display of your recordings. 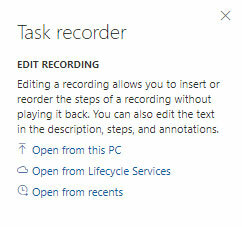 You can playback your recordings and when it is required with various options to choose from. Choose the appropriate source, browse and upload the file in the system. 1. Play next pending step: This is used when we only want to run next pending steps. Pending step is a step which is not yet run in playback. 3. 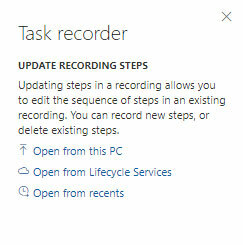 Play all pending steps: This is used when we want to run all the pending steps in the task recording. Upon choosing the appropriate option, system plays the recoding. You can validate it as per your requirement and use thereafter. Task recorder has gone through significant improvement process and became much more powerful tool that it was ever before. If utilized fully lead to better documentation, improved visuals display, high customer satisfaction and better project execution. We are sure above mention information will give you a complete idea. For more info about our Microsoft dynamics AX Implementation Services please contact us.